This afternoon Ewelina and I get on a plane to Mexico City! 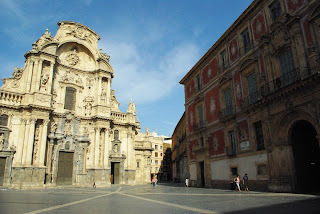 Murcia is a great connection between the modern, and the old. 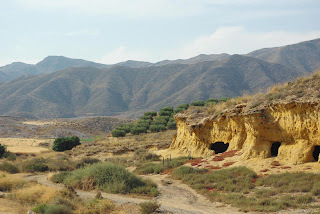 Sandy colours fuse Murcia together with its surroundings: every time I visit this place, I feel like someone founded a city in the middle of a desert. 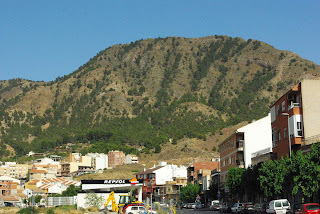 Over 30-degree temperatures make Murcia lively either in the mornings, or in the evenings. We still keep behaving like tourists - Bjarni goes around wearing his Hawaiian shirt, with his straw hat (bought here for a few euros to protect the sensitive Icelander from the sun) on his head and sunglasses (similar story) on his eyes; I walk the town in my new, super-comfortable flip-flops and sleeveless vests, trying to find a hat and sunglasses that would gain my approval. Our escapes from the sun so far have ended in different ways: either we spend an hour in the 37-degree heat waiting at a bus stop for a bus home (Asia and Pedro live outside the strict centre of Murcia, but apparently they are not bothered by it, as "soon the motorway will be built and one will be able to drive to the town in an even shorter period of time"), or we hide in an Irish (!) pub, where there is at least beer and free internet. Being with Bjarni, I've definitely learned one thing: internet is important and there is no point in protesting when Bjarni feels like looking for it. Equipped with this knowledge, I courageously wander around Murcia, patiently halting any time Bjarni announces it's high time to check whether there's a connection here (using his phone). I think I can say now that we've stopped almost everywhere in Murcia. Where it was and where it wasn't after all. Surely, it is in the cafe by our Spanish school, where we enter every day at 8 a.m., asking for two toasts with tomatoes, two fresh orange juices, two coffees and two coca-colas. Surely as well, it is on the bus stop where our 30A bus stops. Without any doubt the internet is also in what must be the only Irish pub in Murcia and on the steps outside a house not too far away from the main square. It is not where it is supposed to be though, all those places that we are told have free wifi, don't. And we still don't know whether it is in an internet cafe we visited by chance: a small, cramped place with only a few computers, shelves full of broken electronic equipment and an old, around 70-year-old man, looking more like a electrician than an computer specialist. A man who, seeing Bjarni's laptop, says with his broken English: "Internet es Internet, another Internet - no, never!" 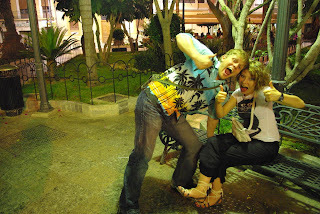 Ewelina and I are in Murcia, taking an intensive 1 week, 4-hour-per-day Spanish course. Today is our second day. It's nice and all, but has the unfortunate side-effect that we have to get up around 6am. Argh. This has been a bit of a theme of the trip so far, getting up at silly hours of the morning. I think Ewelina is secretly plotting to use the trip to turn me into a morning person. Ewelina and I left Rybnik by train early Tuesday morning. (7.57 exactly, Ewelina reminds me.) 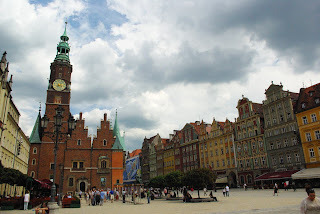 We arrived in Poznań in the early afternoon, walked from the train station with our bags to her friend Maciek's place, where we made our greetings and left our bags before going out to explore. Poznań is a university town, chock full of students and lively as a result. Ewelina studied economics and then philosophy there for 6 years, so she knows the place like the back of her hand. We had perfect weather and with such a good guide; the place seemed fabulous. I might even go so far as to call it my favorite Polish city, but I should probably visit it on a rainy day before going that far. 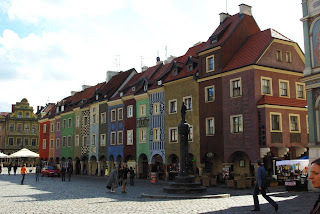 It was for the most part very well maintained, better than most Polish cities I've been to. There was a nice mix of old buildings and new, classical architecture happily coexisting with a gigantic, brand-new, and incredibly tasteful shopping mall built on the ruins of an old factory. I'm generally not a fan of shopping malls, but I liked that one! The city was also full of trees and green places, and downtown on one square the city had dumped a load of sand to create a fake beach where people were playing volleyball and taking dance lessons in the sun. Ewelina's favorite places were cozy cafés and bars, places with low light, funky wallpaper, old furniture, books on the walls and good music. That's right up my alley as well, and the town seemed literally full of lovely little places like that to rest our feet and escape the sun for a bit. We managed to meet quite a few of Ewelina's friends in Poznań, both deliberately and bumping into them by accident. They seemed like good people. Our last stop in Poznań was a cozy little bar where friends of Ewelina's were narrating a slideshow of pictures they took on a 6 month trek through South America! Very appropriate, the pictures were amazing and made me look forward to our own adventures even more. Thursday morning Ewelina and I got on a train to Wrocław, We arrived around noon, stashed our bags in lockers at the train station and headed into town. We visited a lovely little market where Ewelina picked up bags full of her favorite Polish sweets and then went looking for more substantial food. After the food, we visited the main square (beautiful!) and had one glass each of a very tasty honey beer. Halfway into it we realized that it was quite strong: 12% according to the sign! One half-liter glass of that stuff was enough to make me feel a little dizzy... luckily it wasn't on an empty stomache. After the beers we slowly made our way back to the train station, stopping in some shops, a post office and at another bar to see if we could find a usable internet connection to update the blog. That failed, but after riding the bus to the airport and checking in we found a free wifi point there which we could use. Then we got on a plane to Alicante, Spain. At the airport we were picked up by Joanna and Pedro, and eventually fell asleep in their lovely new house in Murcia. As I type this, it is afternoon siesta, around 35° in the shade. Hot, hot, hot, but at least it is a dry heat. In a bit we're going to venture into town to sign up for Spanish lessons and find an Internet café. If we succeed, you'll get to read this! The wedding this weekend was a lot of fun! Much longer than any other wedding I have ever been to - two days! There was much food, much vodka, dancing and games. The weather was also amazing, sun and blue skies both days, so we spent a fair bit of time outside enjoying the weather. Language was a bit of a barrier for me, few of the wedding guests were comfortable with English, and my Polish is quite useless. So I spent a lot of time hiding behind the camera and got loads of good pictures. But I also took part in the festivites, chatted, danced, played games and even (cringe) sang a song in Icelandic. The singing didn't go so well, I forgot the lyrics half-way through, but that didn't seem to matter much, people seemed to appreciate the gesture all the same. Compared with the Icelandic weddings I've been to, and the single Irish one, I'd say the biggest difference was the vodka. The wedding was also longer (2 days! ), and there was much more food than I am used to. They really went all out! And although vodka probably sounds scary to those not used to it, the way it was drunk at the wedding made perfect sense; very small shots, not too frequently, and with lots of food. Nobody got visibly drunk, it was just enough to lift people's spirits and lower their inhibitions enough to have lots of fun and get the two families to mingle and get to know each other a bit. Yesterday Ewelina and I did a bit of shopping and the catch of the day was a pair of very comfy, light hiking boots, which I expect to wear every day for the rest of the trip. I paid 349 zloty for them, which comes to about 80 euro - much less than I would paid for comparable shoes in Dublin. The brand is 'Alpinus', in case anyone is interested or has an opinion. I am sitting at our hostel, waiting for my ride to the wedding. All duded up; black suit, white shirt, white shoes. The white shoes were such a silly idea. Ewelina and I found them for pretty cheap in Dublin a few days ago. What we haven't yet found, is hiking boots. So for the duration of our trip so far, these white shoes have been my only pair and obviously they got dirty rather quickly. Last night I washed them in the shower, lots of hot water and hand soap. Then I tossed and turned all night hoping they would be dry enough to wear by morning. Of course they weren't, but a half an hour on the radiator took care of that. The excitement! Our last couple of days in Dublin were quite busy. I finished work on Monday and then foolishly spent all of Monday night drinking and talking with Al. Tuesday was therefore almost a complete write-off for me, and most of the last minute errands had to be taken care of on Wednesday. Ewelina and I walked and bussed all over the city: we mailed things home, shopped for party supplies, changed our addresses at our banks and at the last minute visited her old employer to buy 1 year's worth of backpacker travel insurance. We had a nice meal to celebrate, and then made it back home by 4pm to pack my bags and prepare the party. It was a ridiculously productive day, and all the walking made it quite a workout at the same time. The party officially started at seven, but it wasn't until going nine that things started to get busy. Lots of people showed up; all the food was eaten and all the drinks were drunk. Most of the stuff we had put in the give-away-shelf was taken, nothing was broken and no neighbors complained. Overall it was a resounding success. I was happy to see how well Ewelina's Polish crew, my work nerds, our housemates and the people from our Spanish class all mixed and had fun together. I love parties like that, it's a shame we didn't get around to throwing one until we were leaving. On Thursday it was Ewelina's turn to be hung over. While she packed her bags I cleaned the apartment. Around 2pm we hailed a cab and stuffed it full of bags: three destined for Oxfam, two massive backpacks, Ewelina's laptop bag and a gym bag full of things she was carrying to Poland. Our first stop was the Oxfam in Phipsborogh, where we were surprised to find Krista behind the till. We gave her lots of stuff to sell and a good-bye hug. By 3pm we were at the airport, tired and hung over and all we could do when faced with a 90 euro excess baggage fee was pay up. Ouch. 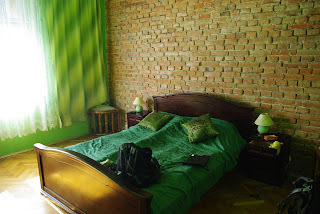 But we made it, and that evening we slept in Krakow, in the most luxurious hostel (not hotel, hostel!) room I've ever seen. 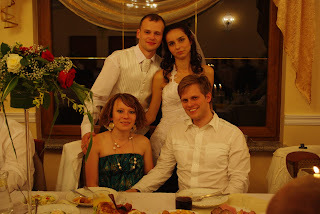 Yesterday we travelled to Rybnik and hung out with Ewelina's family, and today is a wedding. Overall, I'd say our trip is off to a pretty good start! But either way, we are going to be away from home, carrying all our belongings, and the most precious ones will almost certainly be digital. I bought a couple of hard drives, because the first rule is to never have only one copy. Two copies is the minimum, three would be better... to get three I have smaller versions of all the photos stored in the laptop itself. And then whatever we end up uploading to the interwebs is also a bonus. But oh, no, what if the hard drives and my laptop get stolen? I should disguise at least the hard drives somehow. Spongebob likes having a hard drive inside him. See how happy he is? And see what a good job I did on the zipper? Ewelina already thinks I'm crazy, and we haven't even left yet. In 5 days, Ewelina and I get on a plane! Ewelina and Bjarni took a trip!